“Marami pong salamat. Kung hindi po dahil sa kanila [Project implementers], mahihirapan po kaming maglakad pauwi at papunta ng eskwela (Thank you so much. If it not because of them [the Project implementers], it would be difficult for us to walk home and to go to school),” Krystelle Fabrigas, a Grade 10 student of Langogan National High School, expressed her gratitude to the Philippine Rural Development Project (PRDP). 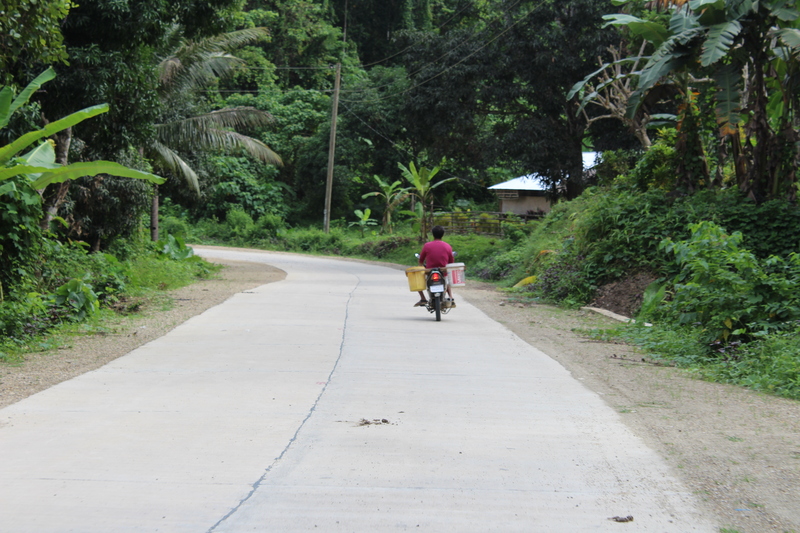 Fabrigas is one of the students who benefits from the PRDP-funded farm-to-market road (FMR) subproject in Brgy. Langogan, Puerto Princesa City. as the implementing agency. Before the construction of the eight-kilometer Bukang Liwayway to Makandring FMR, students from far-flung areas of Brgy. Langogan used to walk for more than an hour on a rough and dusty road. Their situation is more difficult during rainy season when the road is slippery and muddy. According to Fabrigas, she and her fellow students tend to be late or absent during their first and second subjects in the morning because of the poor road. They arrive at school with dirty clothes, shoes, and bags. Usually, their teachers allow them to go home early in the afternoon to catch a truck ride going to their sitio. Their fare now is P10 going to school unlike before where they have to pay P25–P30 per head in a jam-packed motorcycle. With the completed FMR, the students no longer have to suffer like they used to. Fabrigas said that they are now more inspired to go to school, because they can now travel faster and safer. “Mas lalo po akong natuwa tsaka mas lalo ko pong inigihan iyong pag-aaral ko dahil po ayos na po iyong kalsada wala na pong dahilan kami para lumiban (I’m even more excited and I am working harder on my studies, because the road is better and no longer a reason to miss school),” Fabrigas shared. Meanwhile, according to Normie dela Cruz, a cashew farmer from Purok Bagong Lipunan in Brgy. Langogan, she can now expect a bigger income. Because of the FMR, farmers like her can transport their cashew products and other produce directly to the wholesalers rather than wait for buyers who deduct P5 to P10 per kilogram. She also mentioned that the road reduced the hauling cost and cut their travel time, thereby minimizing spoilage. In addition to the convenient transportation of goods, the FMR subproject also motivated the farmers to plant more to increase their production and income. Most of them have already built concrete houses and acquired vehicles.